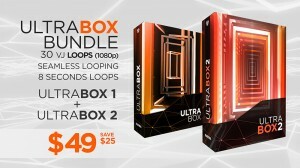 UltraBox is a collection of 10 VJ Loops featuring an array of boxes moving in dynamic patterns. All clips are Full HD (1920×1080) encoded in .mov (h.264). This pack is perfect for VJ´s, nightclubs, led screens, projections, concerts, stage decoration, video backgrounds and many more. We also have created a bundle for those who want it all! Do you want to get a free sample? Insert your details in the form below and we will send you 1 Sample Clip from the pack to your inbox within the hour! !